Allergy to latex products may manifest itself in simple dermatitis, or in a more serious whole body reaction, anaphylaxis. The term "dermatitis" describes an inflammatory response of the skin, caused by contact with allergens or irritants such as the latex in surgical gloves or condoms. 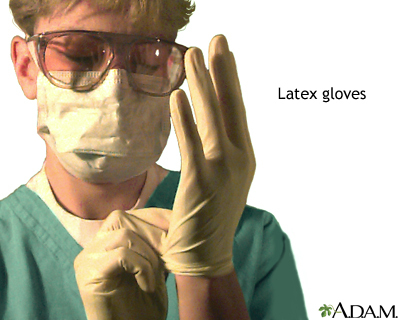 Contact with latex may produce an itchy rash, redness, blisters and scaling, or may cause the more severe anaphylaxis. Anaphylaxis is a series of symptoms including dropping blood pressure, swelling of the throat and tongue and difficulty breathing.